Wow – the holidays are here. How did that happen when only yesterday we were doing summer camps. Maybe the time flew by because we were so busy. S and A #3: One of the events that kept us hopping was our third Scientists & Artists…Party! This is one of my favorite events as it brings together amazing talents from many different fields. The party also gives our students a chance to show off their work and mingle with cool people. 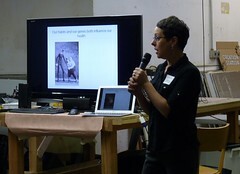 Dr. Rachel Brem represented the Buck Institute and gave us a fabulous glimpse into the world of research science. She described her work, Finding Genes that Make Fruit Flies Fat, in such a clear, entertaining way that we were all ready to sign up for science class. We welcomed a new face to our Autistry extended family, John Hersey. John is considered one of the founders of digital illustration. Though you might not recognize John on the street many of you are familiar with his work. For example the sugar skull sports team illustrations which began when the SF Giants won the World Series in 2010 on the Day of the Dead and John created the now iconic Dia de los Gigantes! He is a great speaker and we look forward to many return appearances at Autistry. A dear friend and longtime Autistry supporter, Cliff Saron gave us a preview of the TEDx talk that he will give in the spring. We were mesmerized as he challenged our understanding of reality and opened up whole new ways of seeing the world. Cliff is a research scientist at the UC Davis Center for Mind and Brain. His work in sensory processing, multisensory integration and contemplative practice sheds light on some of the more complex underlying processes of autism … and neuro-typicalism as well! 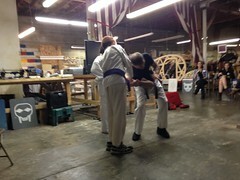 We also had a demonstration of martial arts by Al Loren and his students, April and Chris. They brought us to our feet cheering the lightning fast fists and the high kicks. And then we raced the remote control cars around the track! And, with the help and talent of Greg Nett, we karaoke’d the night away! We may do another Scientists & Artists…Party in the spring. So stay tuned! Entertaining illustrious visitors: Author Rhys Bowen (Royal Spyness Series, The Evan Evans Series and the Molly Murphy Mysteries) toured the studio. 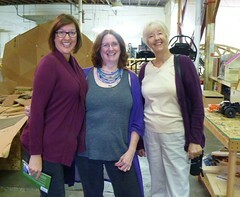 Rhys is from Bath, England but now makes her home in Marin County. She has followed the growth of Autistry and donated several signed books for our silent auction. The Autistry Support Network (ASN) is hoping to host a Tea with Rhys in the spring. The word is getting out about Autistry! Dr. Karen O’Connell, University of Technology, Sydney, Australia was in Berkeley delivering a paper on disability discrimination in the law when someone mentioned the work we do at Autistry. She immediately arranged a visit. 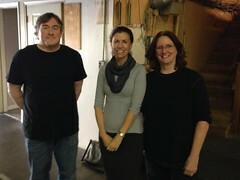 We spent a wonderful morning discussing the issues facing our ASD clients as they grow older and go out into the world. Dr. O’Connell is part of an international effort to reexamine legal systems and the institutionalized discrimination of those with disabilities. End of the Year Challenge: It’s that time of the year when we reach out and ask our community for support. This year we have a $15,000 challenge to match and we are confident that with your help we can do it. Using our Powers for Good is our rallying cry! Check out some of the accomplishments of our Autistry Superstars and help us continue to provide these vital independence building programs. Next week a round up of the amazing Autistry projects of 2014!